And it had the desired effect. During yesterday’s primary, voters around the state, LEGAL voters, were prevented from voting because they refused to check the offensive, unnecessary and illegal box. A ballot application check box asking Michigan voters to confirm their U.S. citizenship caused confusion at polling locations around the state this morning and prompted Secretary of State Ruth Johnson to send a clarifying directive to local election workers. Johnson, who first ordered the citizenship check box to appear on the February presidential primary application, sent out a memo to local clerks around noon explaining that voters are not required to answer the question before receiving a ballot. Under the Michigan Constitution and election law, you must be a citizen of the United States in order to vote. Again, scare tactics designed to freak people out enough to get some of them to just walk away. In Detroit, voters were being frisked at one polling location by a man dressed in fatigues. I’m not kidding. Detroit resident Diane Hughes planned to vote at Henry Ford High School at 7:15 a.m. Tuesday. But the polls weren’t open. When the polls finally did open, what Hughes witnesses shocked her. “There was an incident where people were being searched,” she said. 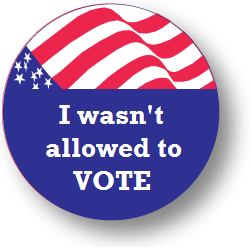 As voters waited in line to enter the polls they were subjected to a pat-down. “Women, they were having their purses open … with the men, Wayne, he was right in front of me, he was being patted down like he was a criminal. And that is what angered me,” Hughes said. She said the man searching voters at the high school was part of school security, though his uniform seemed military. Some Detroit voters were very frustrated while trying to cast their ballots Tuesday morning on the city’s west side. Not only did the polls open late, some voters were patted down as they entered the west side high school. Detroit NAACP Executive Director Darnell Wright went to the school after getting a call on their voter hotline. “There was indeed an individual who was frisking individuals and winding down for weapons, as well as an individual dressed in military fatigues, both of which we believe is a form of voter intimidation,” said Wright. Primary turnout is historically abysmal in this country and Republicans have done everything they can in Michigan and elsewhere to make it even worse. Ruth Johnson’s efforts clearly disenfranchised some voters and she did a piss-poor job educating the election officials she is responsible for about the rules they were to go by. It’s critical that we remain vigilant going into the November general election. You can be sure that Republicans, knowing that their candidates are weak and the issues they support are unpopular, will do whatever they can to suppress the votes, particularly in strongly-Democratic areas. It’s shameful. It’s anti-democratic. And it’s un-American. THAT is today’s Republican Party. @eclectablog Normally agree with you, but security guard was regular guard doing his daily job, didn't realize the rules were different. @eclectablog you're implying it was voter suppression efforts. The vetoed citizenship question is legit, this was an uninformed guard. While I agree with Randy that this security guard was “just doing his job”, it is the responsibility of Ruth Johnson to secure our elections and to make sure any legal voter gets to vote and isn’t intimidated from doing so. She failed in this instance by not ensuring that proper training was done in this urban area. Ruth Johnson IS engaging in voter suppression and improper training contributes to that. I do not believe, however, that this man was somehow instructed to intimidate voters, only that he was not instructed NOT to. And he should have been. I firmly believe that something like this would never had happened if we had elected Jocelyn Benson as our Secretary of State in 2010.